"Spider-Man: Into the Spider-Verse" is currently receiving buckets of well deserved praise, changing the standard for the animation industry. The film has also received multiple awards and nominations. Photo courtesy of Sony Pictures Animation. It’s no secret that movie studios have seriously begun to step up their game. With epic fight scenes, unbelievable special effects and passionate romantic moments, films this past year have exceeded many avid moviegoers expectations. However, one key art form always seems to be forgotten about and tossed to the side. Animated films are continuously being forgotten about due to their typically young fanbase. However, the animation industry has begun to go to new heights to find innovative ways to tell their stories and find new, creative ways to engage their audience members, both young and old. Animation has slowly begun to gain traction with older audiences in recent years, with remakes and sequels of childhood favorites being released almost annually, making many older viewers experience the feeling of nostalgia and joy. However, many still attack the medium, not taking it as seriously as they would a live-action film. 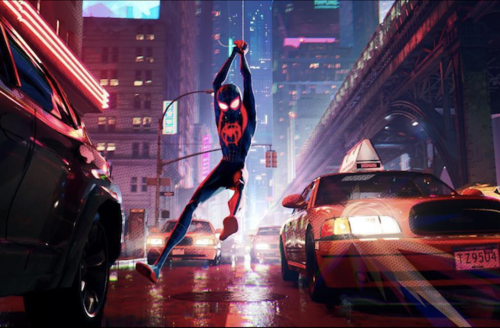 With the release of “Spider-Man: Into the Spider-Verse” in December of 2018, major hype began to form surrounding the genre. Many fans had been anticipating the film for months, but with it’s release, a newfound appreciation was formed amongst the general public. The movie’s unique style and characters, stunning graphics, and heartwarming story grabbed the attention of comic book lovers and moviegoers of all ages. It’s no surprise that the movie has been well-received. The film was based on an already beloved character, and was packed with public favorites such as Hailee Steinfeld, John Mulaney and Mahershala Ali. Featuring a lovely story of self-discovery, acceptance, and finding one’s chosen family, the film hit home for many viewers, especially those of color. Co-director Peter Ramsey stated in an interview with Vanity Fair that the directors all were committed to staying true to street culture and wanted to incorporate many aspects of it as well as include hip-hop influences where necessary, as the main character is African-American. After its release, “Spider-Man: Into the Spider-Verse” quickly gained a dedicated fanbase on social media platforms such as Tumblr and Twitter, who encouraged more people to go see the film through tweets, GIF sets and hashtags. This actually worked quite well, and the movie’s numbers began to grow in the weeks after it was released. The film received endless praise, even after the initial hype began to wear off. Currently, the film has made $322.9 million at the box office, and is still showing in countless theaters, and is not planning on leaving anytime soon. In the weeks following its release, the movie won a Golden Globe for Best Motion Picture – Animated on Jan 9, 2019. But that was not the movie’s only major praise. On Jan 22, the Academy released its annual list of Oscar nominations. “Spider-Man: Into the Spider-Verse” was nominated for Best Animated Feature Film, amongst other movies such as “Incredibles 2”, “Isle of Dogs”, “Ralph Breaks the Internet”, and “Mirai”. In a year with not one, but two sequels to major Disney films, the new and quirky flick was a surprising, but appreciated part of the lineup. Although “Spider-Man: Into the Spider-Verse” has multiple things to credit for its major success, no one can deny the clear links to its stunning animation. This newfound praise for not only this movie and its beautiful style, but for the medium in general, is a huge step in the right direction towards giving animators the true appreciation that they deserve for their hard work.